The City Bible Foundation is based on the infallible Word of God as contained in the Holy Bible. The aims of the Foundation are to evangelize and distribute the Word of God worldwide regardless of race, politics or nationality. Furthermore, anything else, which is directly or indirectly conductive to fulfilling those purposes, will be undertaken. The Foundation shall remain an independent organization, while maintaining close links with other like minded groups. The Foundation seeks to achieve its objective through direct evangelistic work and support, as well as the spread of the Gospel and distribution of God’s Word to the above mentioned regions. Developed and launched in 2007, the City Bible Project of the Loukas Foundation has since proved to be a successful concept of evangelism. Its primary purpose is to encourage and support believers of local churches to become effective witnesses of the Lord Jesus Christ in and around their places of residence be it a village, small town or big city. The City Bible Project is maintained by faithful men and women who are ready to devote the necessary time and finances for the printing, production and distribution of each City Bible edition. This will require the motivation and mobilization of congregations by teaching them the biblical foundation for Christian missions, providing them with the needed training for personal evangelism and instructing them how to follow up contacts and converts. The Loukas Foundation works only through the members of believer’s churches. They are the hearts and hands to distribute the City Bible in support of their witness. The City Bible is based on “ identification” and “communication”. The City Bible Project is organized, designed, printed and transported by the Loukas Foundation without “overhead”. It is a ministry for the Lord. The City Bible is now printed or prepared in 50 countries in 40 languages. Almost 3 million City Bibles and booklets are already spread. The purpose of the City Bible is to activate christians to evangelize and give them the tools to do so. The City Bible is an evangelistic tool! The concept is based on “identification” and “communication”: - Identification with the town, region or village of the receiver. - Communication about the content in an understandable summary. Divine inspiration and infallibility of the Word of God: the Bible. Unity of God the Father, Son and Holy Spirit Total depravity of human nature since the Fall, and therefore forever lost to the unconverted, unredeemed man. Redemption from sin, solely through the sacrificial death of Jesus Christ on the cross. Bodily resurrection and ascension of Jesus Christ after his crucifixion.. Necessity of rebirth by the Holy Spirit for every believer. Permanent indwelling of the Holy Spirit in every believer. Personal return of the Lord Jesus Christ for His church. Coming of the Lord Jesus Christ with his disciples to establish the millennial kingdom on earth. Future creation of a new heaven and a new earth and the eternal Kingdom of God. There is an increasing number of unchristianing and liberalization in Europe. In addition, there is a generation today that neither knows nor has knowledge of Christianity. This generation is now flooding Europe with other religions the moment they set foot on European soil. This requires a new approach of evangelism. Because every Christian has a duty to spread the gospel, the City Bible Foundation wishes to involve the local believers and the local community of believers by facilitating them in this important work. To begin with, God's Word has to be made available in the many languages which are spoken locally. Because the availability of many translations of the Bible is limited, it is important to produce standard publications in as many languages as possible. The accessibility to and the price of these translations have to be as low as possible. Therefore, the aim is to create a partner in each country through a local network. Then, by creating its own website, Bibles and City Bibles can be distributed to the local believers. This way evangelistic material is provided to support their personal testimonies. Distributing God's Word and making it accessible in every available language for each inhabitant of Europe for the costprice or free of charge where necessary. The purpose of this all is that Jesus Christ, the Son of God, will be accepted as a personal Savior and Redeemer. Because there is an increasing number of migration and integration of languages in every European country, God's Word should be available in every language spoken and read within every country in Europe. The City Bible Foundation aims to be representative/have a partner in every country in Europe. Bibles and City Bibles in many languages will be distributed by them at a standard low price or for free. The partners are selected carefully, serve the same passion for evangelism as the City Bible Foundation does and they endorse the goals of the foundation. The City Bible Foundation acts as a central supplier of City Bibles and Bibles. 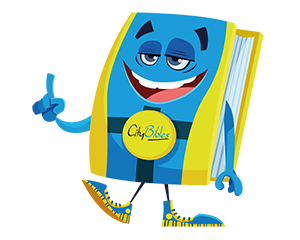 Both the City Bible and the Bible are offered in a standard format for a "fixed price". If desired, a "customized cover" can be made. The City Bible and the Bible are both produced in the highest quality of 30 grams Bible paper.